Kareem Cook and Claude Tellis acquired Naturade back in 2012. However, it wasn’t always an easy journey for these two. These two entrepreneurs have banned junk food from Los Angeles schools, overcome adversity, and have family histories of diabetes and cancer. Their experiences growing up have inspired them to start living healthy lifestyles and share them with the African American community. Kareem and Claude first meet in college at Duke University and later reconnected after attending business school. They made the move to California together and began spreading healthy ideas across the area. Growing up on the east coast both Kareem and Claude believed that everyone on the west coast, and California in particular were extremely healthy and fit. They were shocked to see first hand the rate of childhood obesity in the Los Angeles area. They decided to help reduce that number. This is where their journey to spread health and wellness began. The worked to start a healthy vending company in LA. and were responsible for junk food being banned in LA schools, and leading the state of California to banning junk foods. The pair put the first healthy vending machine in LA and acquired the contract for all of the public schools in LA. While banning junk foods in schools across LA is a large accomplishment the men were unsatisfied. They wanted a larger platform to help African Americans prevent common illnesses that plague the community. Both Kareem and Claude’s families and many African Americans across the country suffer from hypertension and diabetes, illnesses that can be prevented or managed largely based on diet. This passion lead them to develop a business plan to prevent illnesses like diabetes. Their plan involved the purchase of Naturade. Once Kareem and Claude purchases Naturade their efforts to educate the African American community on the benefits of a healthy lifestyle began in earnest. They were introduced to people who shared similar viewpoints, including John Lewis. Kareem and Claude paired up with John Lewis to create VeganSmart, a plant based protein powder. The pair has made strides to spread health and wellness among the African American community, as well as americans across the country. 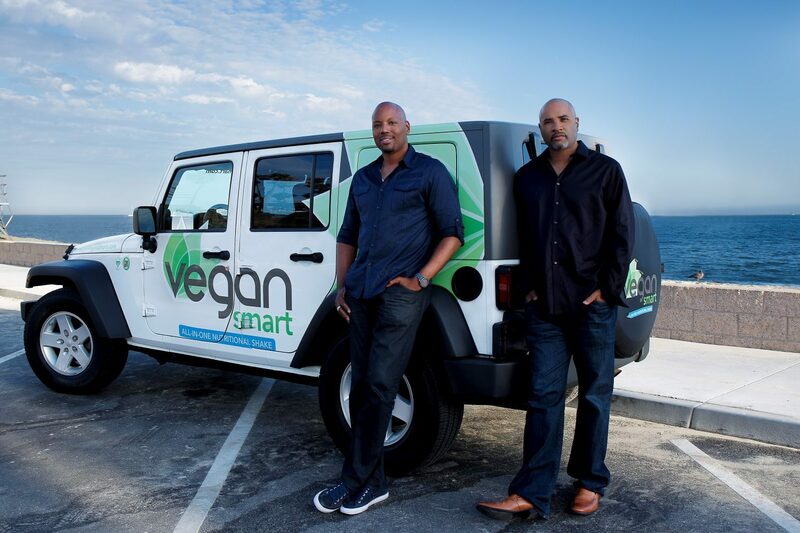 Kareem Cook and Claude Tellis plant to continue to share their passion for living healthy plant-based lifestyles with the African American community. This entry was posted in Articles, Children's Health, Family Health, Health for Men, Health for Women, Health Tips, Vegan Lifestyle and tagged CLaude Tellis, Duke University, Duke University Alumni, health, healthy lifestyle, Kareem and Claude, Kareem Cook, Naturade, naturadelife, vegansmart.